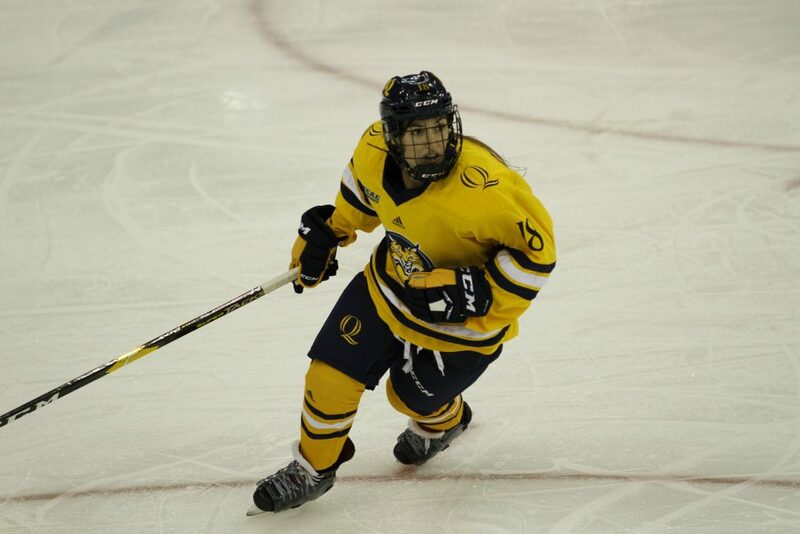 The Quinnipiac Bobcats women’s ice hockey team (9-15-3, 6-8-1 ECAC Hockey) will look to bounce back from a loss to Clarkson against the St. Lawrence Saints (12-11-3, 7-5-2 ECAC Hockey) on Saturday, as the team plays seven straight ECAC Hockey games to close out the season. St. Lawrence is coming off a 4-3 loss at Princeton. It’s no secret that Adzija has slowed down since the start of the season. Quinnipiac isn’t out of the playoff race yet, but if some of the younger players don’t step up for the offense, Quinnipiac will be looking at a long uphill battle. She scored a goal last weekend against Minnesota-Duluth, but other than that, she has been rather quiet on offense. It’s crunch time for the Bobcats, and Adzjia needs to take the lead. The senior out of Chino Hills, California leads the Saints in points and assists and ranks fourth in goals. Bobcats Coach Cass Turner is going to have her hands full trying to isolate Reyes from the puck. The Bobcats did have success shutting down Yale’s Greta Skarzynski in October and could use the same tactics against Reyes. Quinnipiac has been very shaky on defense this season, and the explosive offense of St. Lawrence will take consistency and focus from the Bobcats. If Quinnipiac can win time of possession, St. Lawrence won’t have a chance to get momentum on offense. Quinnipiac can be exploited easily and scoring early will cause the Bobcats to panic and spiral. St. Lawrence is very steady on defense and likely won’t be affected if Quinnipiac scores first. But, getting on the board in the opening period will likely bode well for the Saints. Tune into QBSN’s broadcast starting at 3:00pm. Max Schreiber and Jack Main will have the call for you at puck drop at mixlr.com/qbsn.